FREE ESTIMATE. To buy, auction, sell or consign your Robert Anderson autograph that is for sale, please email Nate@NateDSanders.com or call the Nate D. Sanders Auction House (http://www.NateDSanders.com) office at (310) 440-2982. Robert Anderson is famously known for being the Union commanding officer of the first battle of the American Civil War at Fort Sumter. Anderson stayed loyal to the Union despite being a former slave owner from Kentucky. His actions at Fort Sumter heralded him as an instant hero, and he was celebrated in Union Square Park along with the American flag rescued at Fort Sumter. He then went on a tour of the North to recruit military volunteers and garner funding for the war. 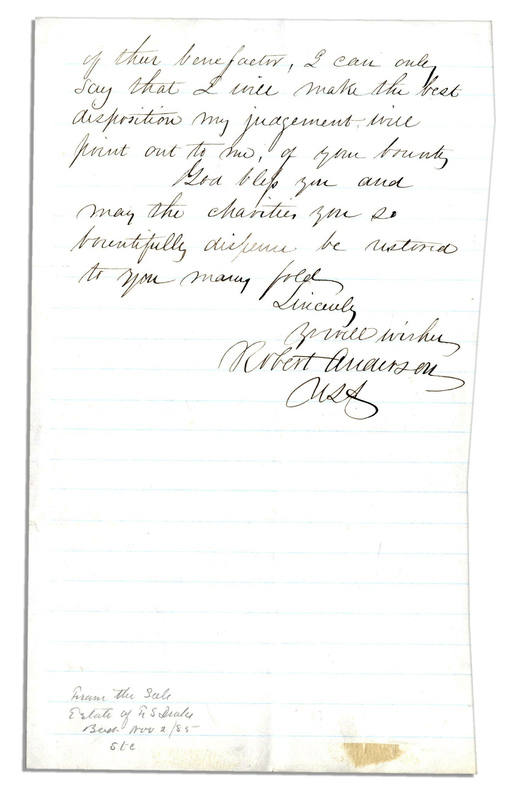 We sold a Robert Anderson autograph letter signed at auction for $1,703. The item can be seen below. The commander of Fort Sumter, Robert Anderson autograph letter signed, “Robert Anderson”, dated 25 April 1861. 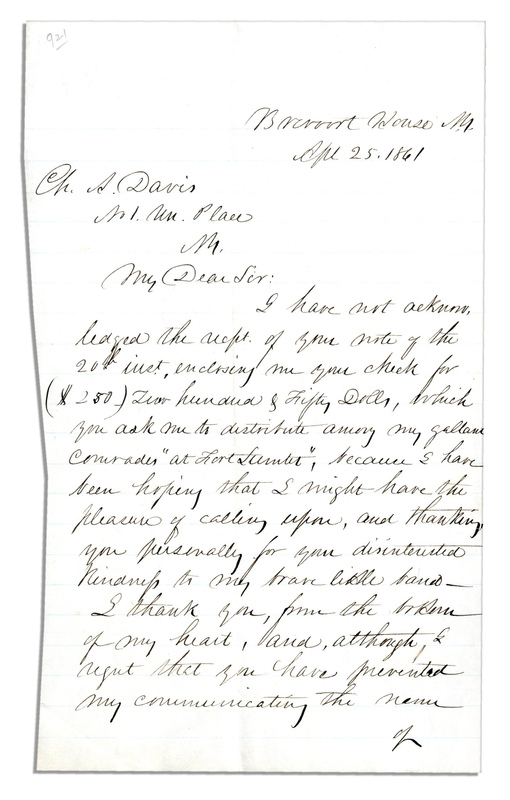 He writes to Charles A. Davis: “…I have not acknowledged the rec’pt of…your check for ($250)…which you ask me to distribute among my gallant comrades ‘at Fort Sumter’, because I have been hoping that I might have the pleasure of…thanking you personally for your disinterested kindness to my brave little band…” 2pp. letter measures approximately 5″ x 8.25″. Uneven trimming to left edge, else near fine. Sold for $1,703. Robert Anderson Writes in April 1861 on Fort Sumter — “…I have not acknowledged the rec’pt of…your check for ($250)…which you ask me to distribute among my gallant comrades at Fort Sumter…”. Click to enlarge.